The Westminster Police Department said officers found Treeanna Nichols, a 22-year-old single mother from Pasadena, dead with multiple stab wounds inside a room at a Quality Inn on Feb. 5 shortly before 11 p.m.
A clerk had called the authorities for a welfare check on the victim, the agency said at a news conference on Wednesday. 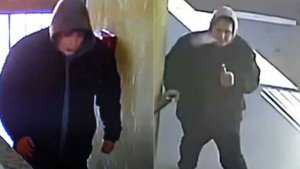 Hoping to receive information about the killer, police released surveillance footage showing a suspect going up a staircase at the motel using a vaping device. The man is seen wearing a gray hooded sweatshirt, a dark jacket and dark pants. He later leaves using a different staircase. Investigators said the footage was taken around 3 p.m. The Police Department described the suspect as a white or Hispanic man between 25 to 30 years old, about 5 feet 10 inches tall and weighing around 200 pounds. He might have been injured during the crime, police said. The agency also released images of a dark, four-door sedan that possibly belonged to the suspect. Investigators said there was no evidence of forced entry at the crime scene, and they don’t believe that robbery was the motive. Anyone with information can call the Westminster Police Department at 714-398-3315 ext. 4572. Those who wish to remain anonymous can contact Orange County Crime Stoppers at 855-TIP-OCCS.